What’s in my Soap Lovelies? Love is always in the air at More Tea Soaperie! Natural, sumptuous & pampered. Silk infused, Glycerine rich. Opulent skin loving soap delicacies. Handmade using only the finest natural ingredients. Tiny pampered, glycerine rich batches. Detergent, sulphates and parabens free. Tested on friends and family NOT animals. This includes my bespoke packaging handbag with acid free tissue paper to cosset the Lovelies. Best Selling floral fragranced, tiny skin nurturing travel sized Lovelies. 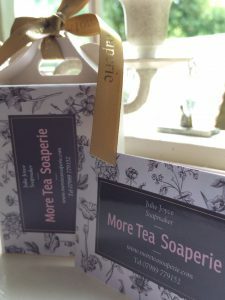 Packaging is bespoke for the Lovelies with delicate acid free tissue paper wrapping to encase the Lovelies and beautiful printed "More Tea Soaperie" satin ribbon to decorate the bespoke handbag. "I just cant get enough of your Bon Bons!!". Happy customer! !, anonymous! "Your products are just amazing. I just adore them all. You are so clever". Ann. "Hi Julie, I had some of your "Lovelies" for my Wedding. Can I say they were absolutely adorable and the fragrance was fantastic, thank you. I am now going to use your soaps every day that's for certain". Lina. "Your products are just so lovely" Katie. "Your details were passed onto me by our lovely Mayoress, would you be interested in bringing your "Lovelies" to our event?. Dawn. "We are always looking for fabulous exhibitors to join us for our events. When I saw your soaps I was super excited". Mel. "I love your soaps so much". Karen. "When you have time could you make me some more, any fragrance, just love them all!" Sallyann. "Wow, are they really soap?, absolutely stunning". Aimee. "Thought of you first for our event, love your products". Elle. All my products are tested on friends and family NOT animals! I use award winning Goats milk fresh from Highfields Farm Dairy, Statfold, Tamworth and finest quality plant oils & butters from Statfold Seed Oils, Tamworth. Staffordshire – All my soap Lovelies are lovingly handcrafted here in Alrewas.